Any traveler - whether you’re going around the world for six months or a long weekend visiting friends - knows that your bag is the most important investment! We love Cotopaxi’s collection, especially the carry on-sized Allpa 35 Liter pack. A certified B Corp, Cotopaxi supports grassroots organizations around the world working towards poverty alleviation. They use leftover fabric scraps to make their eclectic Del Día designs to reduce waste! 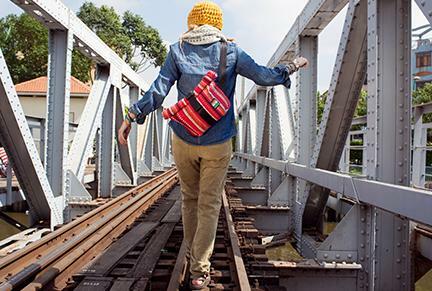 For a smaller day bag, check out Ethnotek’s Cyclo Travel Sling. Their Thread designs are sourced from artisans and weavers around the world - you can pick your colors straight from Ghana, Guatemala, India, Indonesia and Vietnam! They seek to boost these artists economically while simultaneously celebrating and sharing vibrant culture through patterns. Bags are vegan, socially responsible, and water resistant. What else could a Venturer ask for? If you just need a solid purse for everyday at home or on the road, Looptworks Alaska Airlines Knox Bucket Bag has our hearts a-flutter. The luxurious material comes from airplane seat covers! We can’t resist a classic bag that has traveled thousands of miles AND is the perfect size for everyday adventures! If you’re less of a backpack purist, and you’re happy to wage war on plastic waste, check out the Hamilton Perkins Collection’s Earth Bag duffel. Another B Corps, HPC’s bags are each made up of 17.5 recycled plastic bottles, with a liner made of old billboard vinyl! They also support fair wages and best practices for textile manufacturing. Who has two thumbs and is guilty of shoving toiletries and makeup in the same grimy gallon plastic bag? This author is! Even though I reuse bags a few times, they’re neither good for the planet nor good for my travel stress levels. In other words, it’s time to invest in a Dopp kit! These are durable, sustainable and straight up classy! 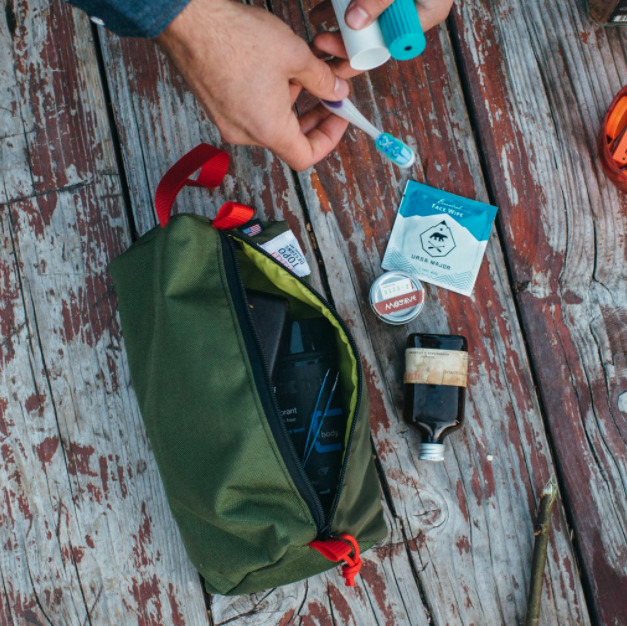 Topo Designs Dopp Kit is made in the U.S. and has a lifetime warranty. In addition to being handmade in Colorado, they also come in a combination of funky prints and colors. They have a kit for any style! The Crest Trail Case by United By Blue is stain resistant, and has a handy outside pocket for easy access to nail clippers and contacts cases that love to disappear under everything else. The black tee is my travel secret to success. Dress it up, dress it down, match it to every outfit, and they never get dirty! (...subjectively.) Looptworks Upcycled V-Neck Tees are made from excess material, turning a pound of fabric destined for the landfill into your new favorite travel outfit. At the end of the day, all that matters is that you’re enjoying your time abroad. The last thing you want to do is waste time shuffling through your bags, trying to find something. These items will make sure you’re spending less time stressing over getting organized, and spending more time enjoying your travels!